Often someone asks a question about how something is done in crochet. Many times it is easiest to answer by video. These three videos have been born that way. They are all techniques I use a lot, so it was fun making videos of them. Lately, with problems in my hands I have changed to often using crochet hooks with ergonomic handles. 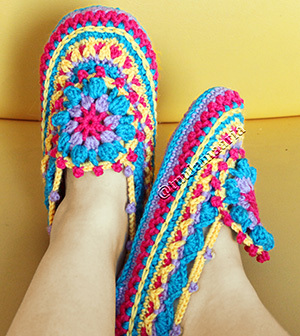 They can help if your hands easily hurt when you crochet for a longer time. V-stitch is possibly my favourite stitch. On the video, you can see several examples of items I have made using it, like scarves and blankets. It is suited for so many different kinds of products. I’m showing it both using double crochets and trebles. My free guide for calculating stitches also works well with the V-stitch. Then you don’t need any other pattern for simple shaped items like scarves, blankets, cushions or bags. Crossed trebles are, like the name indicates, trebles that cross over in the middle. 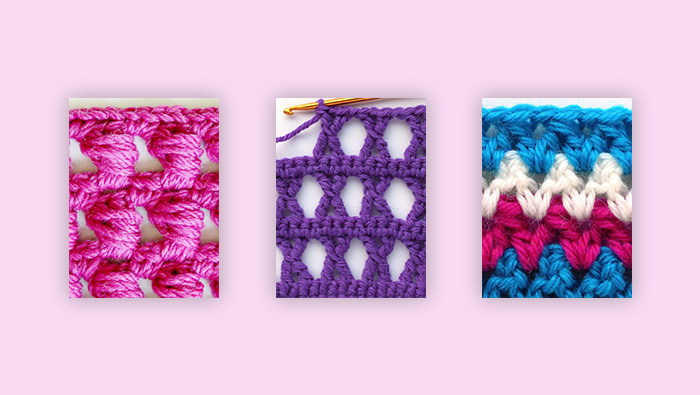 It’s fun stitch that is great in any larger surface like a blanket or as one row here and there among other stitches. I have used this stitch on the bell that was the most popular pattern in my Christmas blog last year. See the Christmas bell here. The wrapped cluster may have many different names, and there are many similar stitches. I love this stitch, especially for baby blankets. It makes them so thick and soft. The downside is that this stitch uses up a lot of yarn because of the wraps. But it is worth it for the outcome! 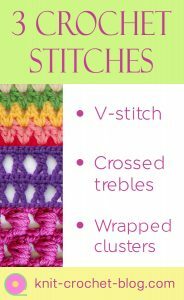 I trust you will enjoy creating new items using one or more of these stitches!